What Day Of The Week Was September 22, 1995? 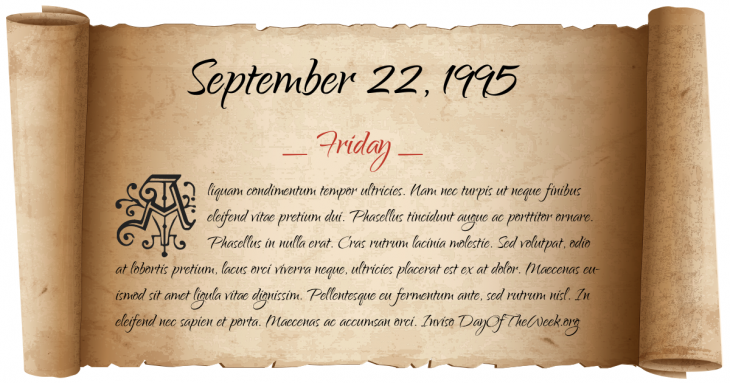 September 22, 1995 was the 265th day of the year 1995 in the Gregorian calendar. There were 100 days remaining until the end of the year. The day of the week was Friday. A person born on this day will be 23 years old today. If that same person saved a Penny every day starting at age 7, then by now that person has accumulated $60.54 today. Nagerkovil school bombing, is carried out by Sri Lankan Air Force in which at least 34 die, most of them ethnic Tamil school children.